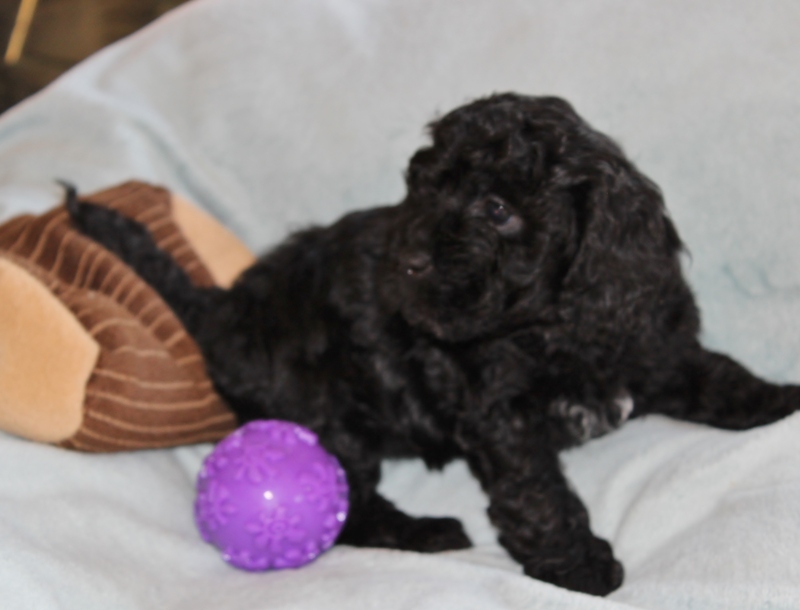 Wondering what to buy for a new puppy? You don’t want to leave anything out and yet there are a million supplies out there. What is necessary, what is just extra? What do I recommend? Below is my “ABC puppy list”. I have made an effort to make this basic suggested supply list as simple or as detailed as you like. Scan through and you’ll get the quick answer to what I suggest you have on hand at home. Read all the text for more detailed explanations and tips. Be prepared to have lots of patience for house-breaking. Have some good puppy pads or newspaper, paper towels and an enzyme cleaner. If you’re going to potty train in your home or apartment read HERE for more on housebreaking and pad training. A nice camera or a good phone with a camera will be imperative when you have your new baby home. You’ll want to keep shots so you can remember “back when” in 8-10 years when your friend is in his golden years. Be sure to learn how to get a picture of a moving subject without it getting all blurry. And remember to email some of those pictures my way! 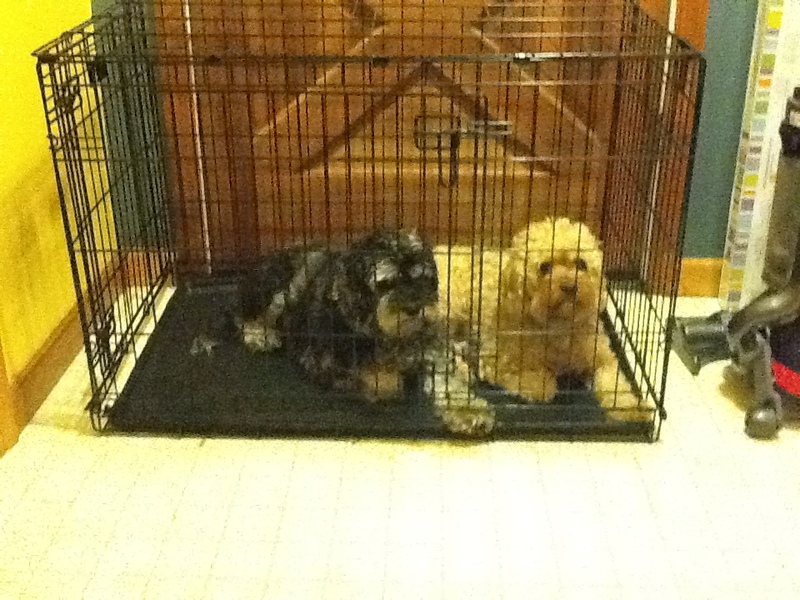 For a Cockapoo I use a dog crate that is around 35 inches wide, 22 inches deep and 24 inches tall (pictured). You can go smaller for a single dog if you like. If your crate is large and your car is not you might want a separate carrier for your puppy for when going to places that might frighten him or transporting him while he is sleepy. A soft blanket or crate pad for inside the crate. Remember a puppy might chew on anything in the crate so for some breeds you might want to hold off on anything expensive. Cockapoos are mostly too soft-mouthed to do any serious damage to any blanket but a crate pad might get torn up. Shampoo. Any tear-free baby shampoo is cheap and the best for little puppies. Older dogs might like a tea tree oil shampoo. Conditioner. Other than to treat occasional itching or skin sensitivities you really won’t need conditioner, but you can use conditioner if you want to, I do. For conditioner I use “Mane and Tail” conditioner on my dogs. A bath-towel. You might not mind drying your sweet little puppy off in the kitchen sink with your personal bath towels but you’re going to mind after bathing a sandy or muddy dog in from a romp in something wet. Nail trimmers. You must get a dog-specific trimmer as a human trimmer won’t properly cut the nail of an adult dog, but will crush the nail off, resulting in painful pressure and cracks and splits up the nail which can be painful, can become infected & they usually are sharper than the original long nail to begin with! There are lots of different nail clipper styles available. There are regular clippers that work the same as human clippers and there are guillotine-style nail clippers. These have a little hole that you insert the nail into, squeeze the handle, and it lops off the tip. I like and use guillotine clippers, they are also less likely to splinter/split a nail and less likely to slip and clip too far up the nail and cause bleeding. I do like using a Dremel tool that has a sandpaper attachment and can file down thick adult nails without the risk of splintering/splitting/breaking the nail, but this requires training the dog not to be afraid of the sound or the vibration it causes their toes. It’s a bizarre sensation for them, I’m sure. A Dremel-type tool is often cheaper (and has many other uses) than the same type of file tool sold specifically for pets. It is also a better quality tool and will not break after 10 uses. I haven’t used the pet type files but I’m sure many of them are useable and even great. There are clippers that have sensors on them that will light up and tell you if you’re too close to the “quick” in the nail that will cause your pet to bleed (and can hurt a bit). For pups with black nails this is really a stress-saver, since you can’t see the pink line indicating where the blood supply is. These clippers are not much more expensive than regular clippers, work well, and I definitely recommend them. Have styptic powder or a bit of corn starch handy when trimming nails in case you clip too short and get a little blood. A hair comb is a good thing too. You’ll mostly find you’ll prefer to use a regular metal-toothed comb for a dog with medium to long hair. A short haired dog can use a paddle or glove or a curry comb style brush. This is good for collecting loose hairs, but also improves blood circulation, oil distribution and removes dead skin cells. Also it feels good and your pal will thank you for it. 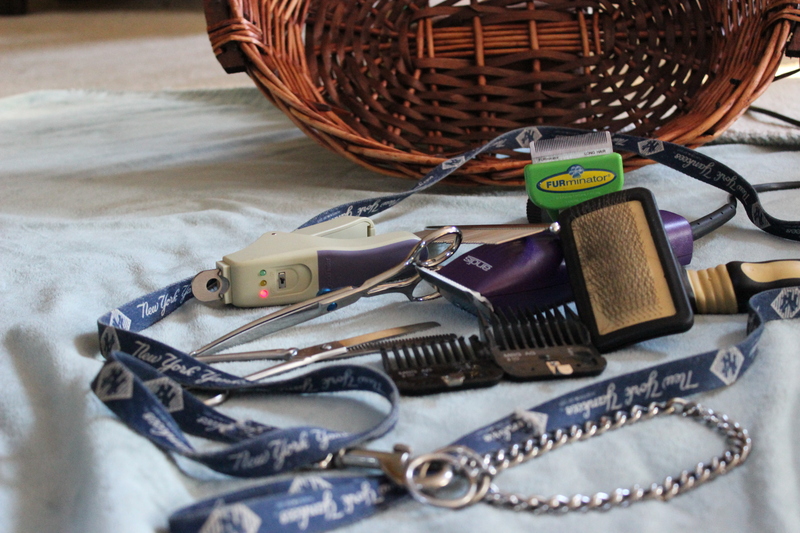 If you’re going to clip your pup’s hair yourself you’ll need a good pair of hair clippers. A good pair of curved safety-tipped shears. 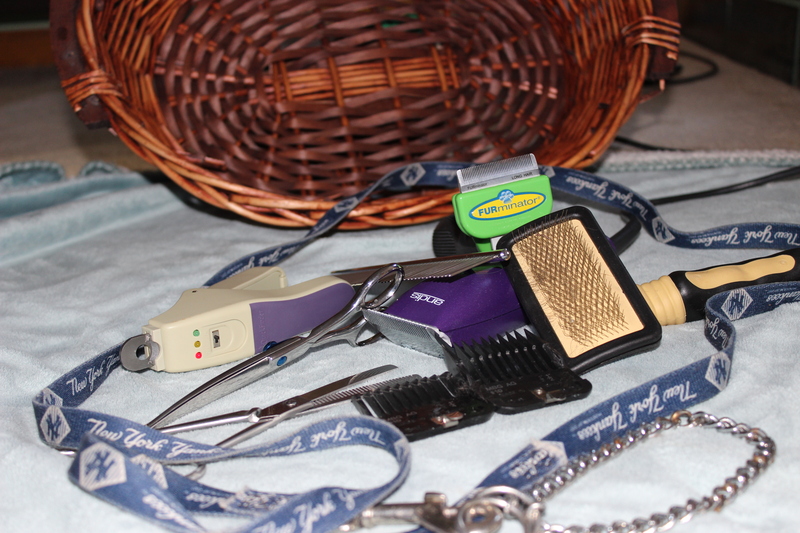 These shears are invaluable for trimming and shaping the hair on your dog’s face and around the eyes. Never use scissors on a dog that lack a blunt safety-tip. A dog can jerk suddenly, and you don’t want to accidentally hurt her. A stab to the eye with non-blunted scissors can be very damaging!! Ear cleaning solution; there are many ear cleaners available. There are also several recipes for homemade ear cleaning solutions that use simple and inexpensive vinegar. These work very well. Always research anything you put into your dog’s body, be it mouth, ears or eyes (even if your veterinarian hands it to you). Read about ear health HERE. An adjustable collar or harness. You might want to wait until you get your pup to size this item specifically. You will want a very light weight harness or thin/light “choke-chain” style collar for walking and a light weight leash to start. For a collar to hold identification and licensing tags you’ll not want a choke-chain and this kind of collar must be removed immediately after walking/exercising/training is over. For daily wear/tag wear you’ll want a traditional nylon or leather collar that has a “quick-release” or safety release on it. These collars are designed to pop off in the event that your pup gets himself hung up on something (like a fence or a tree, etc.) and it will prevent your dog from accidentally strangling himself/herself while playing outdoors unsupervised. A leash. Any leash you like will work. Avoid big-box store leashes. They’re boring. Look on etsy for fantastic leash-makers. You’ll get a well-constructed and unique leash while supporting small business. Win-win. Clicker and whistle. Don’t forget to pick up a couple of comfortable clickers for training. Get more than one. They are cheap anyway and you’ll misplace them from time to time. A whistle is more useful than you think. Your pup will also need toys for exercise and mental stimulation. That’s a whole subject in and of itself and is posted HERE. Food. Seems like a no-brainer until you start learning about all the different foods and what is actually healthy for your dog. 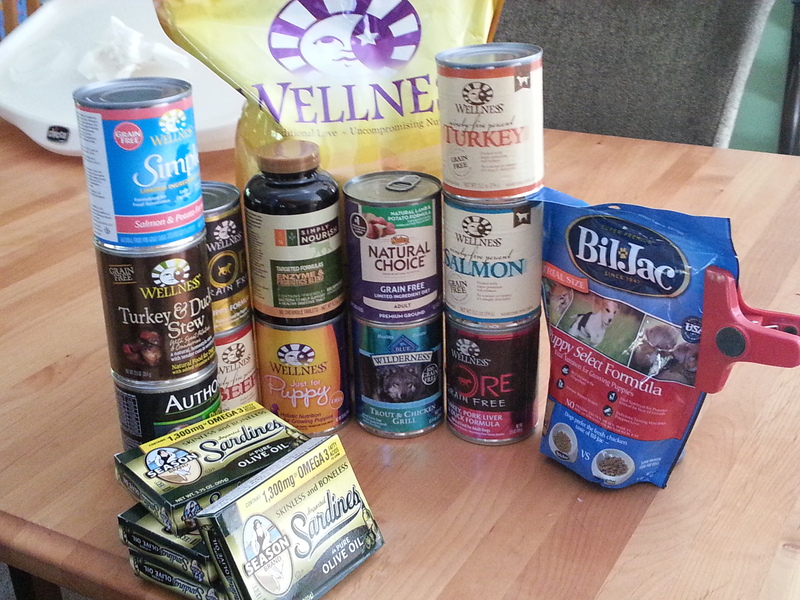 Allocate a decent amount of time to read about feeding your dog and make an informed decision. Talk to your breeder as well and remember that most veterinarians don’t have a large amount of knowledge when it comes to nutrition, and will often recommend terrible brands and varieties. Whatever food you choose I recommend getting a small bag at first. Your puppy could hate it, or you could hate something about it, and then you’d be stuck with a gargantuan bag. Same goes with treats. Get small sized treat bags at first to save yourself the headache of a worthless bag of inedible dog treats. Food-supplements are something that will completely depend on the diet you select. I always recommend a high-quality fish or krill oil and keep a few cans of sardines (bones and all, in water or olive oil) in the pantry. Treats. Small bite-sized and moist training treats are very helpful with a new puppy. This will be another thing to read up on, as treats can be many things straight from the market and do not all need to come from a commercial package. Food and water dishes. Food bowls that are raised slightly off the ground are pretty and can help prevent your pup from laying down and eating out of the side of her mouth (which for some reason lazy little ‘poos like to do sometimes) this can be messy but is a lot of fun to watch. Your puppy may need her bowl directly on the floor since she is really teeny still, but the stand can be used later if you like. Storage solution for dog food and treats. Dog food bags stored in their original packaging are an invitation to mice, rodents and bugs in general. Safety is a must with all the living things in your home! Here on the East coast we have a generous supply of parasitic insects and diseases that can cause your pup a lot of discomfort and even life-threatening illness. It is important to begin treating your dog for flea and tick prevention somewhat quickly. I recommend waiting until your pup is about 10 weeks old to apply these medications, although some brands claim that they are safe as early as 6 weeks. I recommend asking a veterinarian that you trust what their personal opinion is. Heart worms are something that can be a threat, depending on your location. Again, this is a good question to ask your veterinarian. Heart worms are transmitted via mosquito (as are many other nasty parasites) so repelling mosquitoes as well as treating your pet may be a necessity. Puppy-proofing your home is a must. A puppy comes to his new home in the toddler stage of life. They get into everything and need to be kept safe! When safety is the topic you regularly hear “buckle up”! You can use a crate but it must be attached/strapped down to the frame of the car, otherwise in the unfortunate event of an accident the crate (and dog) will become deadly projectiles. Having the crate strapped down doesn’t just potentially save the dog’s life, it saves yours and/or your passengers’ as well! There are lots of “dog car seats” and safety harnesses that work great for the car. You can use a harness advertised as a car safety harness, and these do double-duty as they can be detached and used as a walking harness. There are booster seats that are great for small dogs like the small-to-medium sized Cockapoo because they lift the dog up so he/she can see out the window, avoiding your dog attempting to stand up onto the door/window during travel. These have harnesses or buckles that attach to your existing leash harness that buckle to the seat belt and keep your pooch in place and safe. Do everyone a favor and buckle your buddy up!! Hope this list helps and happy shopping! This entry was posted in New Dog or Puppy, Thinking of getting a dog? and tagged collar, crate size, dog, dog bed, dog brush, dog clippers, dog comb, dog shampoo, dog supplies, leash, nail clippers, new puppy, puppy needs, puppy supplies, water bowls, what to buy, what to buy for dogs, what to buy for puppies, what to buy for puppy. Bookmark the permalink.